Last month I published my first empty products post and decided to create a monthly series so here is February's used up products. This post is a little later than planned, I think March crept up on me and all of a sudden it's towards the middle of the month. March brings us forward into being officially Spring on the 25th when the clocks go forward an hour and I'm so excited to have longer days and for all the new beauty products to be released but I must use up some of my products before I buy anything else. Even though February was a short month I seem to have used up more products than in January, I think sometimes everything runs out at once and you find yourself repurchasing lots of products all together. I have vowed to only buy products that I need and that I have no alternatives to use up so I can get my product stash down to a reasonable amount. I think by the end of the year I should have more room in my bathroom and on my dressing table. I'll breakdown this list of products into groups of; hair care, skin care and body products. 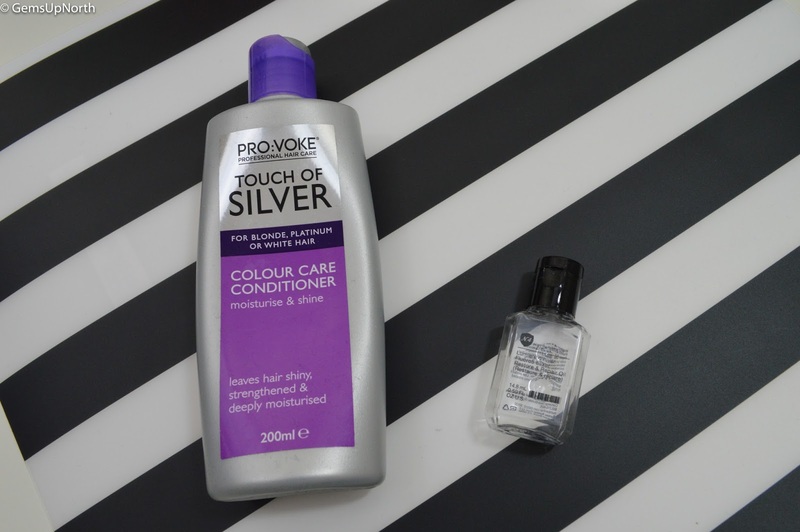 I started to use purple shampoo's and blonde hair care products as soon as I changed my hair colour to blonde. I was actually surprised at how many products are available to help keep your blonde hair looking blonde; it was also a shock at how much work it takes to maintain a nice blonde shade on my hair. This conditioner is a good product to use after purple shampoo which can sometimes dry my hair out, the conditioner adds softness and helps care for my hair. I have found that other conditioners I have used have worked just as good if not better than this though; its just an ok hair care product in my eyes and has a budget price tag but I am not going to repurchase. Number 4 was introduced to me through my Birchbox subscription back in my October box and I picked another mini sized bottle up when I built my own Birchbox in November last year. I absolutely love this hair oil and it has done wonders for my damaged hair, a little goes a long way hence this tiny bottle has only just rang out from receiving it in October. I like that I can see results as soon as I apply the oil to my hair, I tend to work the oil into the ends of my hair more so than my whole head. As soon as my other mini bottle is used up I will take the plunge and purchase a full size which I am confident will last me for ages. B6 is something I wouldn't be without now, after the MUA on my local counter recommended it I have used it almost everyday. I like the refreshing feeling on my skin after spraying a couple of squirts on my face before doing my makeup. I think this travel sized bottle has ran out at the right time too because UD have re-designed the packaging of their sprays and B6 now has a new look. I will continue to repurchase this product and I like to buy the travel sized bottles because they fit in my makeup bag easily unlike the full sizes which tend to live on my dressing table. I suffer from breakouts quite often and can suffer more at stressful times so I need a good spot care product. I've been using Witch's blemish stick for years and always repurchase, I find it works really well on my skin and always has even throughout my spotty teenage years. The stick is so simple to use, push the product up and apply to problem areas and that's it! It's also a really great price and a lot of the time on offer or available in budget beauty stores like Body Care and Savers. I picked this toner up with an O2 priority deal quite a while back, the product was one of Boots/O2 freebies. I have used this toner whenever my other toners have ran out so between my regular products. I have to stay it's not a favourite toner of mine as I'm not a huge fan of cucumber scented products but this one isn't too over powering so it was ok. 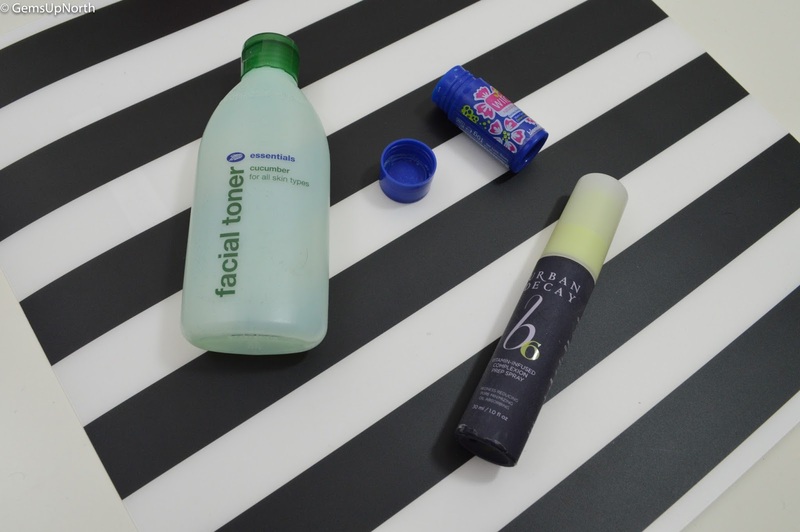 The toner was quite refreshing on my skin and left my face feeling very clean. 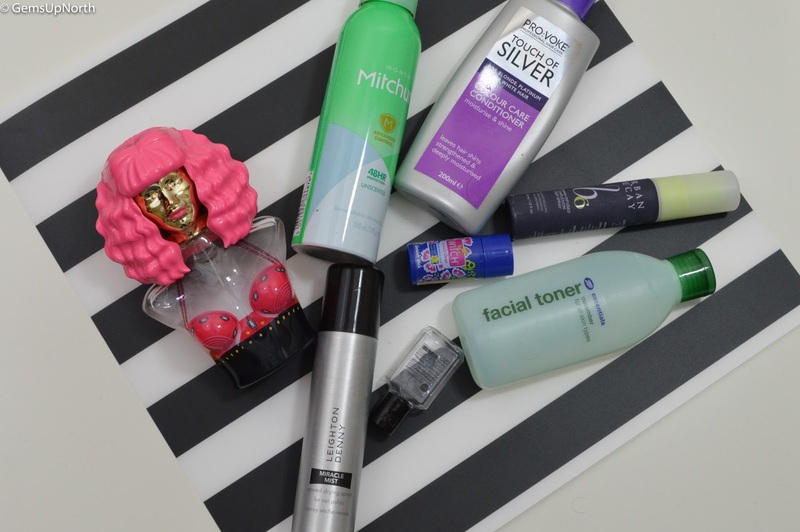 I probably won't buy this toner in the future though as I prefer my regular products. The only deodorant I use because it suits my skin! 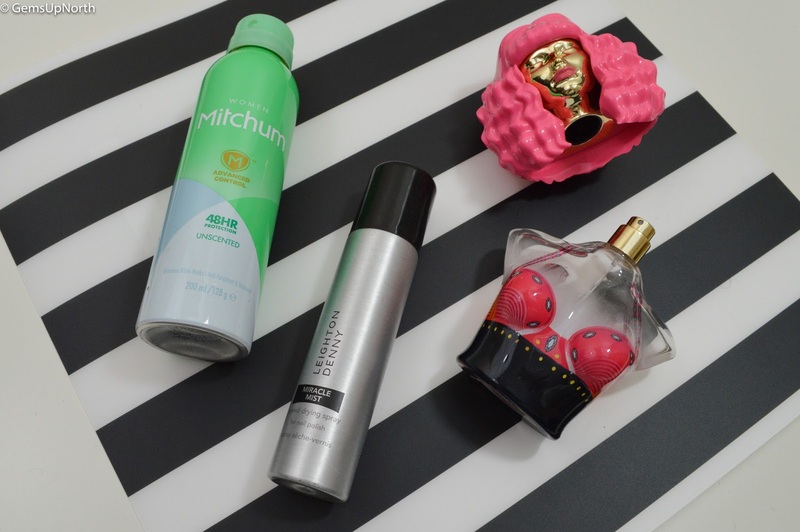 After years of trying different anti-perspirants and finding that they irritated my under arms I was happy to come across Mitchum. I have no issues at all with this spray and always go for the unscented one. Most of the time I can pick these up on offer, either 2 for £4.00 or the smaller cans are usually £1.50 in Wilkos. I've been using this product for years now so it is something I will always repurchase. I received this Miracle Mist in my Glossybox last April and was so pleased with it from the first use, I was surprised I hadn't used a product of its kind before. This mist once sprayed onto freshly polished nails makes them touch dry!! Yes no immediate smudging which I'm consistently doing when I paint my nails. Now I haven't used this each time I've painted my nails but it has still lasted quite a while so the £12.00 price tag is value for money when I think about it. I would like to try other brands that have this sort of product to compare so I am now on the look out for new speed dry sprays, got any recommendation? Send them my way. I think this Minajesty Perfume from Nicki Minaj has a wonderful scent and is perfect for all year round. I prefer to wear this as a day perfume rather than a night one since the scent doesn't last as long as some others. I got this bottle as a gift at Christmas 2015 so 100ml has lasted me over a year, I have around 3 other perfumes which I alternative between for day time and I am actually gutted this one has ran out. I would definitely repurchase as its a good price for an everyday beauty item but I will stick to my plan and use up all my others first. Let me know what products you've used up last month/repurchased and don't forget to check back in April for my March used up products. The perfume bottle is a fierce one, I like the majority of her fragrances tbh. I think we all have our fav products so even though we try our new products we go back to the fav all the time. It's a good price for atoned though. I can't rate the miracle most enough, it's so helpful and I think everyone who paints their nails should own a product like it haha.